UBERSUGGEST is a keyword generator tool that we could use in order to find the relevant keywords for our content. Finding the right keywords will form part of the overall goal to rank well in search engines. Getting organic traffic to our blogs requires a lot of hard work and yet another daunting task. As bloggers, we should exert more effort in order to achieve a great Search Engine Optimization (SEO) result. I wrote this post to serve as a guide for new bloggers like me who are struggling in learning about search engine optimization. This post will help you go through the process of finding the appropriate keywords for your blog posts. *This page contains affiliate links to products I recommend. If you purchase something from this page, I may receive a small percentage of the sale at no extra cost to you. Additionally, I have my own e-Book being sold on this platform. Read the complete Full Disclosure. One of the greatest knowledge I came across while trying to learn the basic of SEO, is to ensure the quality and originality of the content. A content that possesses a superior value will always be on top. People are searching for contents that could answer their queries, something that can help solve their problems. Readers are looking for a timely and relevant answer. Having this in mind, we should see to it that our contents could deliver an answer to a certain issue. Where readers are looking for answers, we should provide solutions. The length of our blog post is another major factor to consider. 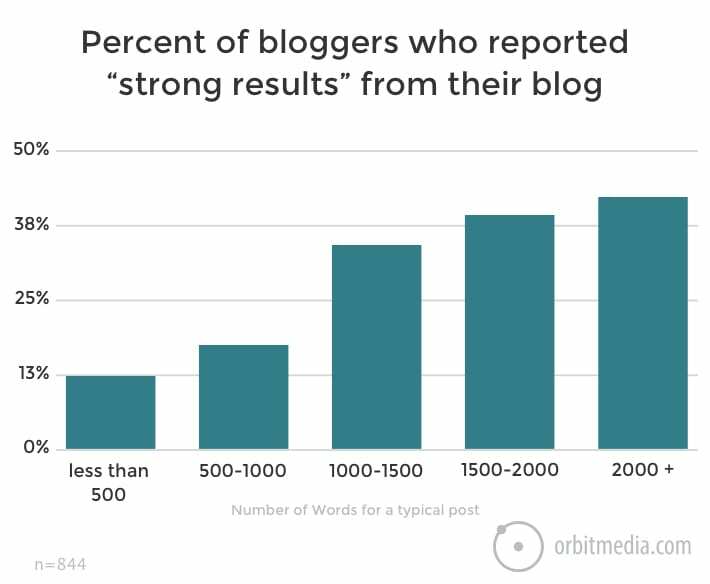 On this data presented by OrbitMedia, it was shown that longer posts tend to get a better result. Writing a long-form content would mean a comprehensive presentation of a certain topic. Though it may not always mean a high-quality. So, it is important to note that we need to create valuable long form contents. The absence of one factor will certainly affect us in the long run. Good content should be presented in a logical and coherent way. It should present a whole concept. The flow should follow a format that will encourage the readers to stick on the page because they found it relevant and informative. How we organize our thoughts can affect the overall quality of our contents. What is the key message of our content? How effective we are in the present of the idea will reflect on the reaction of the audience. This may include the ability to convey ideas clearly and effectively. Do we need to add images and videos to the content? Does linking the content to another article will help in order for the reader to understand better? Have we presented the idea in a manner that captures the attention of the reader and retains interest? Every writer has their own unique way of presenting an idea. We need to discover which is the most effective way. The choice of the appropriate keyword/s is vital in search engine optimization. The keywords we use should represent the idea we want to express in our content. In order to get the benefit of using the proper keywords, we should take into consideration how readers would search for a particular topic. This way we would be able to create a post that matches what the readers are looking for. Another great discovery I had while exploring the online field is the use of Ubersuggest in finding the right keyword for my contents. Admittedly, I used to write without any direction. Meaning, I write whatever comes into my mind. I am thankful for Bitlanders for opening my eyes in the proper use of keywords. Why Do We Need a Keyword Tool? With 3.5 billions of searches being made every day, it would be a daunting task to know which will be the right keyword for our content. a Keyword Tool is designed to give us which keyword/s we should be using for a certain topic. We cannot just make a guess on what readers are searching. We need a tool in order to help us find the most appropriate keyword. That is where Ubersuggest comes in. Ubersuggest keyword research tool is a helpful app that we could use in order to find the keywords we could possibly use in our posts. Great marketer Neil Patel has acquired the site and continue working for its improvement. It’s a great tool which could provide information that would bring benefit to our blogging and marketing activities. The site is simple and easy to use. You just visit the site and enter the topic you want to write about. You don’t even need to sign up or log in to use the tool. Above all, the site is free to use. Version 1.0 has basic features. You enter the topic you have in mind and click enter. Suggested keywords and phrases will populate the page. Monthly search is also available. The original layout of Ubersuggest when I first used the app was almost similar to the current design. It was simple and easy to use. I used the platform for my Bitlanders’ blog posts and it was given me the needed help I needed. After filling out the dedicated space for the desired topic, suggestions will automatically appear giving us plenty of options for keyword optimization. The number of monthly searches is also available. With the Ubersuggest 2.0 additional functions has been added. Aside from the monthly search volume and keyword ideas, we will be given ideas as to the SEO difficulty, paid difficulty and Cost per click. Here is an example, I entered the word blogging on the space and here is the result. The search volume has been presented as well as the monthly search was elaborated further on the presented graph. SEO Difficulty was given emphasis and an explanation was likewise presented. Based on the explanation, the keyword blogging has a high competition and the chance of ranking for the said keyword is low (36%). The paid difficulty was also given as well as the cost per click. Monthly search volume is still part of the result as well as the keyword suggestions. With the new and improved platform, Search Engine Results Pages (SERP) was also included. Meaning, the result includes websites which are identified by the search engines to provide information based on the search query. With the updating and continuous effort in order to improve the site, the new Ubersuggest is now offering much more help. In order to achieve ideal content that will perform well in search engines, we need to apply the four major strategies given above. A high-quality and original content, long-form content, well-presented article, and proper use of keywords. Aside from the great benefit, the best thing is that we can use the site for free. We don’t even have to log in and we can use it as often as necessary.